“Hidden Heavenly” is an apt term for a Tahoe ski resort that is more than meets the eye. 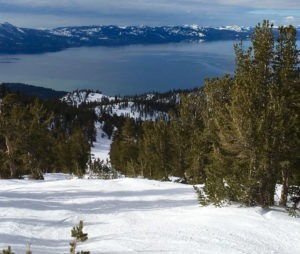 Want to get in some extra runs at Heavenly Mountain Resort on a crowded Sunday? Get out of bed early, hop on the Gondola by 8:30 a.m., and be one of the first ones to point your skis or snowboard down the mountain. Part of the great allure at Heavenly Mountain is skiing amidst the trees. However, skiers and riders need to have a game plan and keep safety issues at the forefront. Although Heavenly is an enormous Tahoe ski resort that features 28 lifts, 97 trails and is stretched out over 4,800 acres, it still can feel crowded on a busy weekend. Yet here’s the thing about Heavenly – the mountain has more secret stashes where opportunistic skiers and riders can veer into than any resort in the Lake Tahoe region. Don’t believe it? Check out a trail map. Heavenly is a veritable mountain of trees, which means the pursuit of fresh snow in a relatively uninhabited location is sometimes an endless journey following a good snow storm. Of course, those “secret” locations are nothing a person could spot riding up the chairlift. It requires a dip into Scorpion Woods to discover some freshies amidst a grove of somewhat intimidating trees that will leave many people content to sample some very mellow groomers. It makes no difference where one ventures around Heavenly – California side, Nevada side; beginner lifts, or the narrow chute-laden areas off Mott and Killebrew Canyons – the exploration is endless. Many of these areas are little spots around the mountain that only the locals really know about. 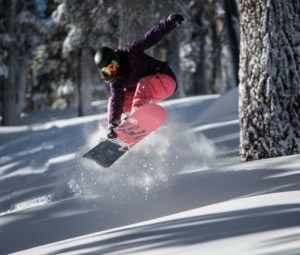 Most skiers and riders stay on the groomers, but there are so many trees at Heavenly where a lot of times one can find a stash of fresh power days after it snows. If you really want to experience the real Heavenly, one needs to try skiing the trees. There are plenty of intermediate runs where the trees are spaced far apart and there’s not that much pitch, so even a low intermediate can do it. Part of the great allure at Heavenly is skiing amidst the trees. However, make sure you have a game plan and keep safety issues at the forefront. Don’t look at the trees, look at the gaps in between the trees. Keep the eyes forward and have an idea where you want to go by plotting out a path. Work on making lots of short radius turns on groomed runs, which will be helpful when among the trees. Heavenly offers tours for individuals or groups that provide a day-long exploration of the mountain’s many undetected areas. The session comes with some helpful ski tips as well. Experts should explore the tree runs and steep, tight chutes off Killebrew and Mott. Note that the wooded areas off famed Gunbarrel – Hogsback and East Bowl Woods – are not for the timid. Yet tree runs off Powderbowl, Canyon, Dipper and many other chairlifts are much more suited for the intermediate crowd. If you really want to experience the real Heavenly, one needs to try skiing the trees. There are plenty of intermediate runs where the trees are spaced far apart and there’s not that much pitch, so even a low intermediate can do it. Many of these areas people go by and never even realize how fun they are to ski or ride. Hence the term, Hidden Heavenly.